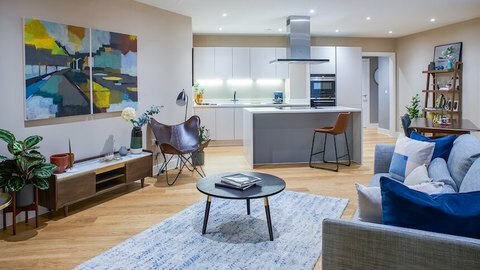 New i.d Interiors have recently designed two luxury show apartments to showcase in the chic new Barratt Homes riverside development situated in Landmark Place, Tower Bridge. The interiors have been expertly dressed to the finest of standards. Living room: Here, this open plan living room offers residents a dynamic, spacious and practical living space - as perfect for hosting as it is for relaxing. 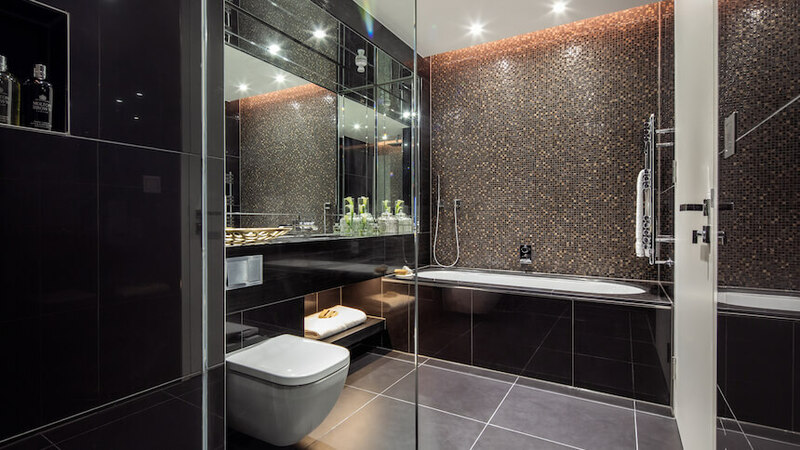 Featuring a chic taupe palette, injected with dashes of warm browns and strokes of black, this living space perfectly combines classic and contemporary design. With luxe furniture and accessories from Kelly Hoppen London, detail is strong yet subtle, featuring beautiful textures and geometric shapes. 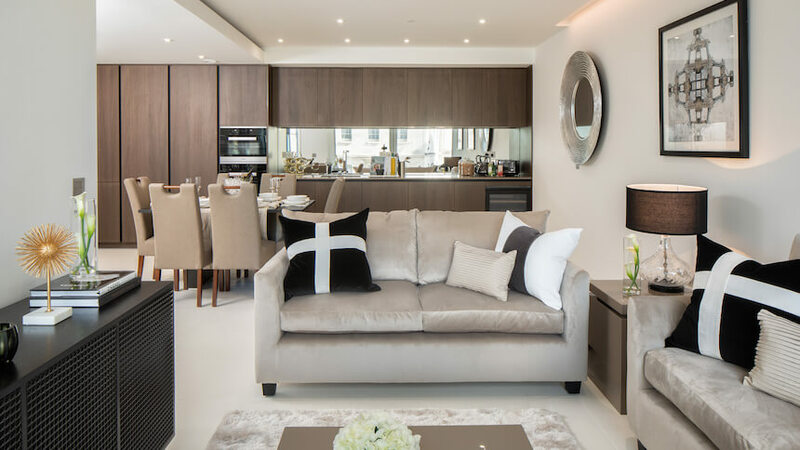 Kitchen/dining room: Carrying through the neutral palette of the living room, the combined kitchen and dining area is ideal for central London living. 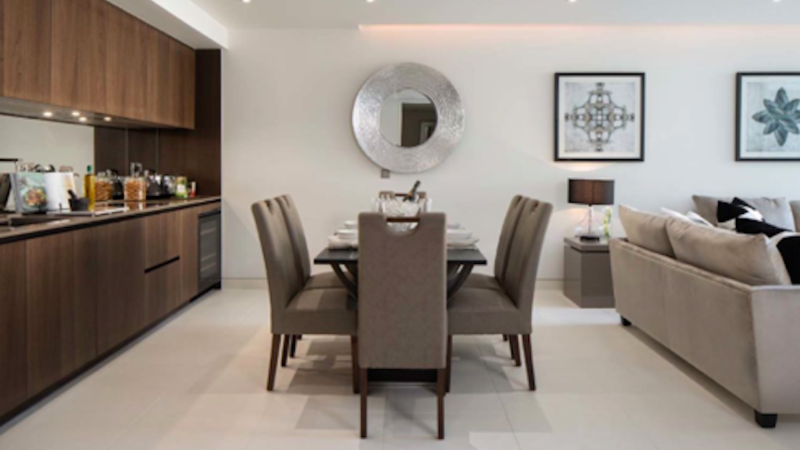 The modern dining table sits at the heart of the room, and tall-backed, upholstered dining chairs feature hints of dark wood that complement the kitchen fittings. 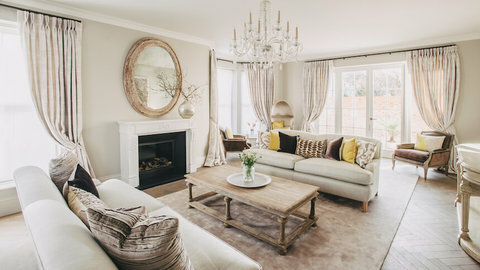 A decadent, metallic round mirror further opens up the space and is the perfect modern centrepiece to flatter and brighten the muted, earthy tones of the space. 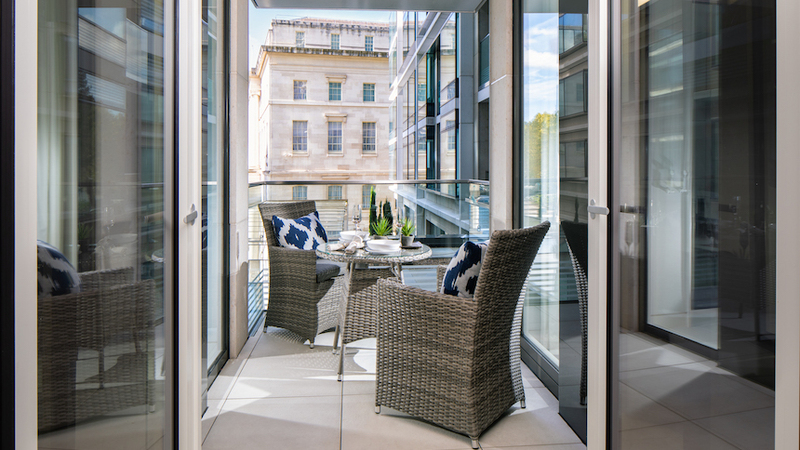 Balcony: One of the properties most spectacular features is the hidden balcony which offers residents their own private sanctuary to relax, and dine alfresco. To informalise this outdoor space, we chose relaxed rattan furniture and injected with punches of block printed navy to keep it modern and sophisticated. Master bedroom: With such an impressive space, we wanted to make this room bright, open and functional as possible. The king size bed, adorned with a beautiful geometric bedspread sits in the centre of the symmetrical decor, and a beautiful, and highly functional window seat offers another area to relax. 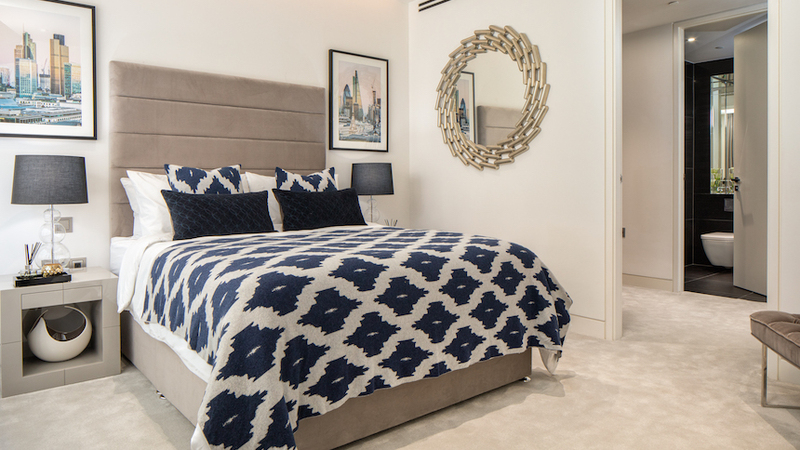 To acknowledge the unparalleled position of this luxury development, we have framed this master bedroom with unique artworks that replicate the position of the surrounding London skyline. 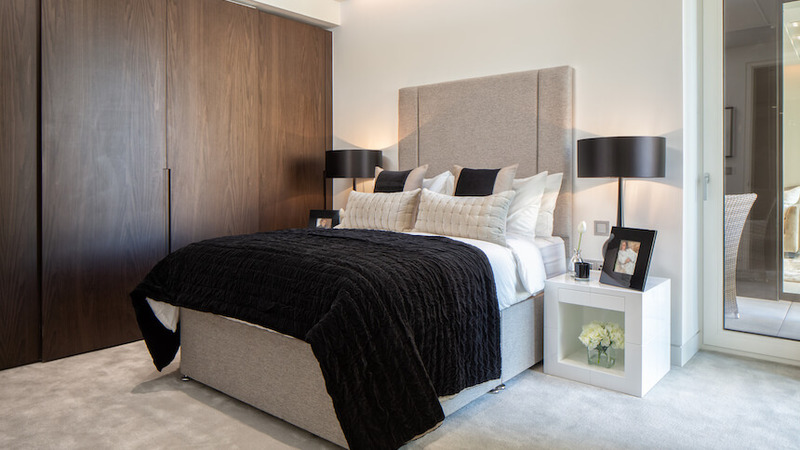 Guest bedroom: With a darker colour scheme than the master bedroom, the decor of the guest bedroom has a sharper air; with deeper infusions of matte black to complement the rich, wooden fitted wardrobes, this room is chic and sophisticated. Awash with textures, such as linen and velvet, the room is also fitted with luxurious. taupe carpet, and afforded a modern edge with two matching white lacquer, bedside tables with and contemporary black table lamps.